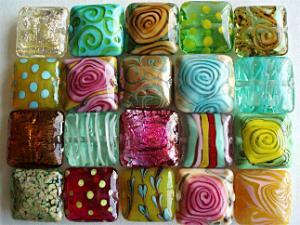 Rising star on the Lampwork horizon, we bring you Maureen Nugent's story! Maureen grew up in Brisbane with 3 talented sisters, an artist Mother and mechanically-minded Father - she learnt how to sew, cook, draw and love colour from an early age. Many travels as a young adult took her to London and her first job in advertising, where her intense interest in all things "visually creative" blossomed. 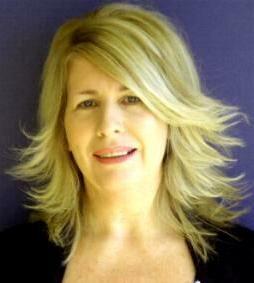 Maureen now lives in Melbourne with her husband and son. Dabbling in many different artistic mediums since childhood, Maureen finally found her niche in ceramics and "Mud Pies Handpainted Ceramics" was born. This became her work and play for 14 years. The creating of tile murals led to painting whimsical walls and panoramas in local schools and private homes. She admits "I went through a phase when I would paint anything that didn't move! I still dabble when time permits." Maureen's introduction to lampworking came thru her sister Janice Quinn - also a talented lampworker - in 2005 whilst on holiday in Brisbane. Move over Colin Firth! She knew immediately that beadmaking was going to be the new "must do" thing in her life. Fortunate enough to be able to devote a good deal of time practising at the outset, Maureen was determined to make Beads her business and set about to create a style of her own outside of the norm. She says she has never felt the need to take lessons from other accomplished beadmakers. It has been a conscious decision on her part to take on the challenge (and reward!) 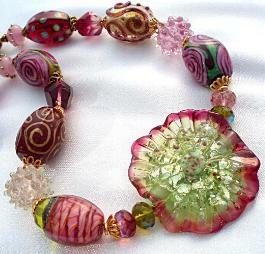 of creating her own uniquely identifiable beads without being influenced by the styles of other artists. After 6 months and a mountain of "bad beads" Maureen felt ready to put her product on the market and Beadoire was up and running. The retired ceramics studio was re-commissioned and became the "bead room." The addition of an overhead exhaust system and stacks of shelving to house a large collection of almost overflowing bead boxes was all that she needed to acquire. Maureen uses a Hothead Torch, and her setup and tools are very basic but quite effective. Amongst her favorite tools are: a butter knife, a dental pick, a bar-b-que skewer and a pair of long nose pliers. Moretti, Vetrofond and Czech are her current glass of choice, however she does use BullsEye from time to time when a particular colour is needed to compliment the chosen palette. Recognizing that her "style" has been evolving over the past 2 years, Maureen has worked hard to perfect her techniques and is now able to incorporate the beloved and favorite imagery of hearts and roses into her jewellery as design elements. Each day she approaches the torch with a piece of jewellery in mind rather than each bead being an individual. The "pancake beads" she used in the necklace that won Beads Etc's Australian Jewellery Designer of the Year competition, have become a signature look in a number of the necklaces that she sells. These beads are large slabs of glass, beautifully tactile, and the amount of time that goes into each one varies from 30-60 minutes. Lots of silver foil brings constant amazement at the effects that can be had using such a cheap embellishment. "Instant Bling" as she calls it! Asked what inspired her, Maureen says she rarely runs out of inspiration for bead designs, but when the occasional bout of creative constipation strikes she turns to her book of William Morris prints or watches Vanity Fair on DVD - lots of stunning costumes and jewellery. Otherwise there's always the shops and browsing - as colour, texture and design inspiration is everywhere. Maureen currently sells jewellery at an artist's market in Melbourne once a month. It is there that she does her part for public education regarding our craft, and talks to her customers about the mechanics of lampworking and the difference between buying locally handcrafted beads as opposed to the cheaper imports. Hopefully the message is spreading! 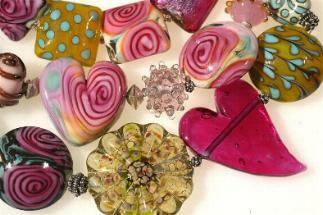 She looks forward to the Victorian Bead Society Expo in November - the only bead show she does - where she will be selling her lampwork beads along with her range of Czech glass strands and findings. (www.beadsociety.com.au) Mark your calendar! Scheduled to exhibit at the Manly Gallery in Brisbane this coming September (mark your calendar again folks! ), the next few months will be an exercise in concentration to have her body of work ready. The chosen theme is "Theatrical" which will entail pushing the boundaries as far as the size of the beads can go (the bigger the better) and incorporating a sense of drama into her designs. Her only regret is that during the course of a day she can't bottle all the ideas that come thick and fast into her head - for use at a later date. No surprise at all too, that Maureen is often approached at the market by ladies wanting to learn lampworking! Her advise is always the same: Steady hands, good eyesight and the ability to leap our of your chair at the speed of sound when a lump of molten glass lands in your lap! Further good advice from Maureen and this is very important: It is a lot of hard work to turn beadmaking into a business, so don't give up your day job until you are sure you can generate the same income through selling beads. Having said that, she thinks everyone should experience the magical, therapeutic sensation of being able to turn a blob of molten glass into a wearable, desireable object d'art using a craft that has been alive for centuries. 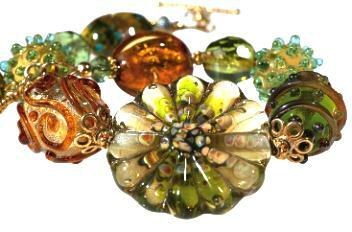 Several of Maureen's beads also appeared in the AGBG's very successful 2008 Calendar. Check out Maureen's website: www.beadoire.com We look forward to seeing more from Maureen in future!